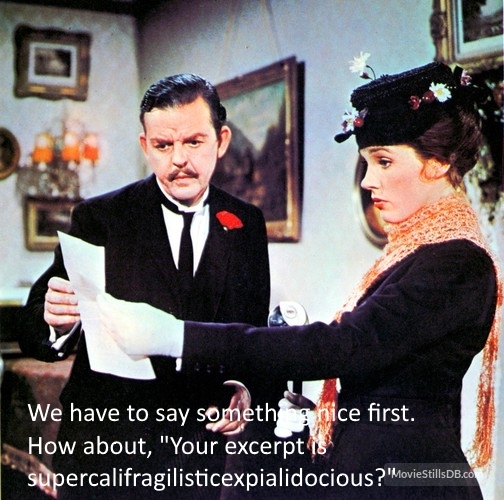 Or practically perfect in every way. Jason wiped sweat from his brow and searched the steep trail. A dark fissure loomed in the mountainside above. He nodded and continued his strenuous climb toward the scar in the earth. Jason reached up, clutched the small holds in the rock with his quaking fingertips, and pulled himself onto a ledge. Regaining his feet, he stepped closer and peered into the dank tunnel he had mistaken for a crack. “Hello,” he called, his voice echoing in the deep recesses of the cavern. Nothing. Unbuckling the leather sheath that held his long sword to his back, Jason shrugged out of his pack and removed an object wrapped in burlap. He carefully untangled the thick cloth protecting the fragile glass of a lantern, and lit it. The faint glow was barely visible in the bright sunlight. After stashing his pack in the nearby bushes, and with his sword in hand, Jason proceeded into the cave. The moment he crossed the threshold he was struck by the strong, foul smell of mold and rotting flesh. Quickly removing a handkerchief from his pocket, Jason tied it around his mouth and nose, trying to filter out the stench, before walking carefully into the cavern. The remains of many creatures littered the floor; large cracked deer bones, a bloody plucked wing, and the dark sticky stains of so much blood. A loud crunch sounded as his boot crushed into something brittle. Jason lifted his foot and gazed into the empty eyes of a human skull, the jaw shattered under the toe of his boot. Taking a deep slow breath, Jason stepped carefully around the bone fragments, bowed his head in prayer for the dead, and continued forward. Deep within the bowels of the mountain, a hunched figure pawed through a pile of rusting pocket watches, mildewed coin purses, and decaying playthings. It grunted and gently removed a china doll, the once beautiful dress now in tatters and one of its glass eyes missing. The creature brushed a lock of matted blonde hair back from the face and clutched the toy to its chest. It walked to the far wall of the cave where a pile of ragged blankets and clothes lay bunched into a makeshift bed and settled into the nest. Lying curled in a fetal position with the doll wrapped tightly in grimy arms, the creature closed its eyes and was soon drifting to sleep. As the dream fog settled around her feet, Fiona found herself in a dark, drafty stone chamber filled with the eerie wailings of the wind and the rapid beating of bat wings. She reached out trembling arms and tried to touch the walls, but her fingers grasped cold air. Mother, she thought, trying to call out but no sound escaped her throat. Father? David? Where is everyone? “They are gone.” Fiona spun toward the low, hissing voice hidden in shadow. The sound of a heavy body moved on Fiona’s right, the echo of claws clicking on the stone floor. No! I-I don’t believe you. They would never do that. “They had no choice.” A ball of eerie green fire appeared on the ground before her, and she stared into the flaming red eyes of a monster, its lips pulled back from razor black teeth in a triumphant smile. “For no one can withstand a dragon.” The beast lunged toward her and Fiona screamed. The creature lurched upright in her nest, the doll shattered in a shaking grip. She glanced frantically around, scanning for the nightmare beast. The cave was empty. Rocking back and forth, the creature tried to calm her racing heart. She could still see the monster’s eyes staring at her, its look piercing her soul. Fiona, the creature thought when her heart had subsided to its natural rhythm. That’s my name, my identity. Who I was before . . . Suddenly, a light pierced the darkness and Fiona scurried to the far wall as a figure emerged from the tunnel. Jason inched cautiously into the large cavern, lifting his lantern to provide as much light as possible. The faint glow combined with a tiny shaft of penetrating sunlight revealed a moldy lump to his left. Curious, Jason went to it and saw that it was a makeshift nest made of blankets and tattered uniforms. Nestled in the bottom were the shattered remains of a china doll. Jason knelt and picked up the toy and stared at the scratched and broken face. Pity rose in him for the once beautiful creation now reduced to ruin. Behind him a scratch and scurry echoed. He rose and, drawing his sword, slowly turned. Raising his lantern high, Jason willed it to illuminate deeper into the darkness. The creature crept forward and stood just outside the beam of sunlight, hesitating. It glanced between Jason and the light then over its shoulder at the concealing shadows. As if startled by what it saw in the darkness behind it, the creature faced him again, took a deep breath, and stepped into the shaft of sunlight. The burned and blistered face was decidedly female. Raw black lips protruded under an oft-broken nose, and stormy grey eyes stood out like letters against her papery skin. Flaming red welts crawled down the side of her dirt-stained cheek and onto her throat, disappearing into layers of fabric. This is a great story! I enjoy your descriptions, in addition to the air of mystery you’ve built by switching between the characters’ points of view. In all honesty, it was difficult for me to find any macroscopic issues with your manuscript. However, I do have some suggestions for fine-tuning. First, some of your sentences seem a bit stretched out. Take, for example, “Quickly removing a handkerchief from his pocket, Jason tied it around his mouth and nose, trying to filter out the stench, before walking carefully into the cavern.” Periods usually serve the purpose of allowing readers to take a breath between sentences. After I first read this sentence, I felt almost out of breath, as if the period hadn’t come soon enough. You might want to split this sentence and others like it into two shorter ones, for an easier read. Also, in the second section of this excerpt, the first paragraph describes this new character as a “creature.” As I read, I pictured this creature as a nameless being, and when the second paragraph came around, I thought Fiona was a different character. You might want to make it clear in the first paragraph of this section that the creature’s name is actually Fiona. For example, you could insert an appositive, like “The creature, Fiona, brushed a lock of matted blond hair…” This would tell the reader that Fiona and the creature are one and the same. All in all, this is a very well-written story, and I wouldn’t be surprised if it became a full-fledged novel someday. Keep writing! Thanks for your encouragement, Tyler. I do have a problem with run on sentences, so will work on that. The section where I transfer from the creature to Fiona, while making the distinction that Fiona is the creature, has been . . . interesting. Will definitely apply your suggestions and see how they work. Wow! I love how you’ve updated this! 😀 It’s so much more engaging and descriptive. I like the changes you have made. Having a name for your explorer is an immediate benefit, making the story feel more personal. It keeps getting better. Your descriptions are excellent. Since the piece has improved so much, my comments will be pickier than usual. I would make this, “After regaining his feet …” because he has to regain them before stepping. After stashing his pack in the nearby bushes, and with his sword in hand, Jason proceeded into the cave. I don’t think he can remove the handkerchief while tying it around his mouth and nose. A loud crunch sounded as his boot crushed into something brittle. If you are attempting to show this from Fiona’s POV, referring to her as a hunched figure harms that perspective. You are showing her from the POV of someone outside of her, as if this is omniscient POV. Do you mean “shattering”? If not, this should be two sentences. Then I would continue using feminine pronouns for the creature, such as – “He reached out his hand and brushed her shoulder.” This would change the later reveal of gender, but I think it would help. Thank you for all your input, Mr. Davis. Personally, I think picky is better (gives me more to perfect). I will be sure to implement your suggestions.